The technology advance from a single-element detector to a multielement focal-plane array (FPA)-which resembles the charge-coupled-device (CCD) chip in a conventional digital camera-has enabled camera designers to remove the complex mechanical scanning systems of moving mirrors, prisms, and polygons of the earlier single-element detector designs that were used to create a two-dimensional image. However, unlike the visible-light CCD, IR FPAs respond to heat rather than light, and are constrained by the need to insulate each element in the FPA from its neighbor, and by the fact that the very energy falling onto each element affects its performance (see Fig. 1). As the heat from adjacent electronics or the temperature of the case varies, or as the heat from the target in view itself varies, the detector gain and level values will intrinsically drift away from stability and cause nonuniformity in the image. Even worse, these heat sources cause noise that increases with time. To correct the nonuniformity, a mechanically operated calibration shutter mounted immediately in front of the detector is raised-like a flag or wink-into position in front of the detector to block off all incoming energy from the target and allow the detector to be recalibrated against a fixed source. This recalibration is required at intervals varying from a few seconds to a few minutes, depending on the factors that cause detector drift at any time. Manufacturers of infrared detectors have tried to reduce the amount of detector drift by stabilizing detector temperature with either a thermoelectric (Peltier effect) heater/cooler or a microrefrigerator finger mounted directly onto the detector. However, both these mechanisms offer only a partial solution within narrow operating conditions and with high consumption of the all-important power budget of the imaging system. Until recently, a significant and seemingly impossible goal remained for all those involved in the thermal-imaging industry: eliminating the need for the one essential moving component of an IR camera-the shutter. Since the dawn of solid-state FPA-based thermal imaging, shutterless operation has been considered the “holy grail” of the industry. Current-generation FPA-based cameras require frequent shuttered calibration and blanking off of the incoming signal with the “shutter” or “flag” to render the observer “blind” to the scene for several seconds at a time. In critical situations such as target tracking, on-line machine vision, head-up displays, or weapon-based applications this complete obstruction to vision can be inconvenient and at worst, fatal. This shuttered or blinkered approach-though quite effective-has several obvious and major problems associated with it. First, when the shutter closes for the detector to calibrate, the user can see nothing. Second, this calibration process can take up to several seconds and can happen frequently, depending on the camera and its operating environment. In situations in which the user needs to see to survive (such as when operating a vehicle or seeing hostile personnel in complete darkness), shuttered operation is unacceptable. But because the industry believed that a shutter was unavoidable, the compromise of regular loss of vision had been accepted as part of the technology. With the escalation of global military activity in the war against terror, improved night-vision solutions are being sought to assist the forces. To work reliably in combat conditions, all equipment must be ruggedized and durable. In addition, the elimination of any unnecessary moving parts reduces unreliability and fatigue over time. Not only does removal of the shutter reduce these negatives, but overall system weight is reduced and the unit requires less power-important factors in the increasing use of smart unmanned aerial vehicles, in which size, weight, and power consumption are critical. Another issue is the actual acoustic noise associated with opening and closing the shutter, a problem that can “make or break” covert or undercover missions. 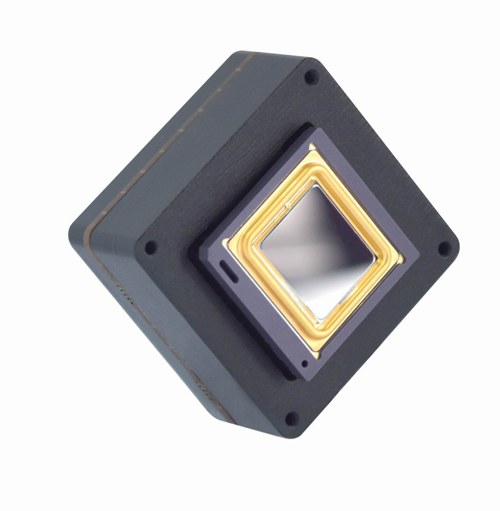 To address these requirements, iTherml Systems launched the first silicon-based FPA thermal-imaging camera with its shutterless proprietary Shutterless technology (see Fig. 2). The SmartCor is an ultra-compact IR camera with “Never Blind” thermal imaging (see Fig. 3). The camera is designed without a shutter or any moving parts and is unaffected by shock or vibration. The first step in this innovation came from an earlier camera that introduced an amorphous-silicon detector, which eliminated the thermoelectric heater-cooler or microrefrigeration from the device, allowing the detector to drift freely from a stabilized or fixed operating temperature. Thermoelectric (T/E) heater-coolers can only stabilize the detector over a relatively narrow operating ambient, and the wider the ambient control required, the more power is consumed. Accordingly, detectors only maintain their quoted performance within the controlled temperature range of the detector and once the detector starts to move away from its control point, picture quality and performance suffer while still consuming maximum power. The amorphous-silicon technology, however, has three immediate benefits: instantaneous operation, reduced power consumption, and reduced cost.